ERDO is a registered Canadian charity that operates humanitarian programs in Asia, Africa, South America, the Middle East and Eastern Europe. ERDO provides emergency relief and rehabilitation programs in countries around the world. Our most recent crisis response work includes the Philippines and help for Sudanese refugees in Uganda. 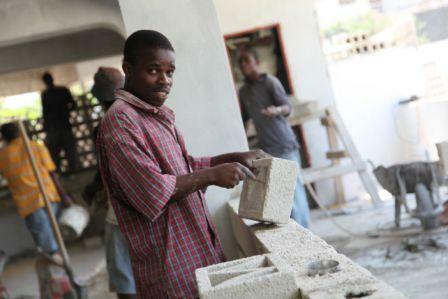 Pictured above is some construction work taking place in Haiti. ERDO actively creates clean sources of water for communities around the world. This well brought clean water to children and families in Bangladesh. We have successfully installed 54 tubewells in various places of Shetabganj and Birganj area of Dinajpur District of Bangladesh. Each tubewell provides fresh drinking water to 20 – 25 families every day, helping approximately 6750 individuals. Sometimes the problem is too much water. In the case of Thailand in late 2011, floodwaters affected people's access to food, work, school and sources of fresh water. ERDO, through our Global Workers, was there "doing good". Click each of the countries below to see more about the work ERDO is doing. Child Sponsorship (ChildCARE Plus) countries are marked in dark red.